Camp nurses are in a unique position while caring for their charges. They work directly with the campers and counsellors 24 hours a day throughout their camp stay. For some children, their time at camp is their first ever time away from home and their parents, so if they become ill or are injured, the camp nurse is even more important. At the same time, many counsellors are teen-agers themselves and if they become ill, they are also the camp nurse’s responsibility. Camp life, with the shared living quarters and new experiences and activities, can lead to illness and injuries. Camp nurses must work on keeping their charges as healthy as possible while dealing with illness and injuries that occur. Because of this close interaction, camp nurses are well placed to not only help spot and act on infections, but to help educate the campers and camp staff of the importance of infection prevention and sepsis awareness. Sometimes incorrectly called blood poisoning, sepsis is the body’s often deadly response to infection. Sepsis kills and disables millions and requires early suspicion and treatment for survival. Sepsis and septic shock can result from an infection anywhere in the body, such as pneumonia, influenza, or urinary tract infections. Worldwide, one-third of people who develop sepsis die. Many who do survive are left with life-changing effects, such as post-traumatic stress disorder (PTSD), chronic pain and fatigue, organ dysfunction, and/or amputations. Although sepsis is the major cause of death within hospitals, up to 87% of sepsis cases originate in the community before patients are admitted.3 Sepsis in children attending camp can be triggered by any number of infections, from infected cuts and scrapes sustained on the playground, to contagious infections, such as pneumonia, influenza, and meningitis. Many of these infections can be prevented or treated effectively if caught in the earliest stages, thus reducing the risk of sepsis. According to a report published in 2012, half of children in the US who have severe sepsis also have an underlying disease, like cancer or heart disease.4 Knowing this, professionals who work with students who are compromised in any way can be aware of this increased risk. That being said, although half of children who are affected have an existing illness, half have no predisposing factors for developing sepsis, yet they still get it – so awareness overall is paramount. Meningitis affects children of all ages, but teens are at particular risk of contracting Neisseria meningitides, which may be prevented through a routine vaccine. In the US, vaccination against meningitis is recommended for adolescents. Children attending camp may be exposed to elements that they may not experience as part of their usual living situations. For example, many children who rarely leave the city may never have been exposed to poison ivy or poison oak. Touching these plants can leave uncomfortable rashes on the skin. While these rashes don’t cause sepsis, they are terribly itchy and uncomfortable, and can result in broken skin – which can develop a bacterial infection. They also may be bitten by bugs much more than they are at home. Scratching these bug bites can break open the skin, allowing for an infection. 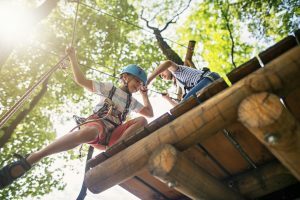 Sleep-away camps also give children the opportunity to try activities they may not have tried before, with outdoor activities such as roasting marshmallows on a bonfire, kayaking, jumping in waterfalls, or rock climbing. Or there may be new indoor activities, like wood working, cooking, or crafting. All these activities could result in injury to the skin: burns, scrapes, cuts, or even blisters from walking in new shoes or hiking boots. However minor, all skin injuries are an opening for germs to enter the body and cause an infection, particularly in a camp environment that may not be as clean as at home. So extra care is needed to keep injuries as clean and uncontaminated as possible. Washing your hands is the best defense against contracting infections, but too many people – children and adults – are not washing their hands as effectively or frequently as they should. Reminding staff about the importance of hand washing, as well as encouraging administration to make available waterless hand cleansers throughout the cabins and other buildings would likely increase compliance. Campers should also be reminded about the importance of handwashing and soap and water should be readily available for them to do so. This simple step can help reduce the incidence of infection caused by bacterial infections, such MRSA, and viral infections, such as influenza. The summer months in North America aren’t usually associated with flu season, which tends to cover much of the school year, but the flu can be contracted year round. Every person who works with children knows the types of injuries and illnesses that can occur. When camp counsellors and other staff members are knowledgeable about basic signs and symptoms of infections, they can be the ones to draw attention to the situation. Counsellor and staff information sessions. Counsellors and other camp staff are not nurses and are not expected to be, but arming them with sepsis knowledge could save lives. The Sepsis 911 Information Kit, a program aimed towards the public, provides camp staff with a prepared presentation and a consistent message about what sepsis is, how it may be prevented, and how it is treated. The program was written with the general public in mind and has supporting materials for the presenters. Sepsis and Children is a video describing how a boy developed sepsis and his progress from a previously healthy child to a young man with limb loss. Medical advances have allowed for people surviving illnesses that previously resulted in certain death. However, sometimes the survivors are left with long-lasting and life-changing physical and medical challenges. As more children survive severe sepsis and septic shock, camp nurses may see more children who have had sepsis. These children may be struggling with any number of issues, ranging from lasting effects of major surgery, amputations, dialysis, chronic pain/and or fatigue, hair loss, even PTSD. They may be unable to perform in activities at the same level as they did before their illness. To see an extensive list of conditions, ranging from chronic illnesses like diabetes to emergency situations like appendicitis, and their links to sepsis, please visit Sepsis and… at Sepsis.org.